One shopping trolley, two car tyres and fishing line were bagged during the Playa de las Azucenas clean up… oh and plenty of rubbish sacks. 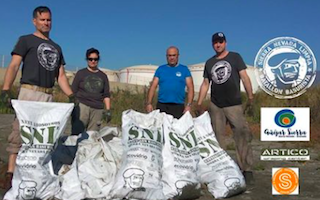 The clean up was thanks to volunteers from the SNL Batallón Basurista, who spent the weekend targeting this peripheral Motril beach, just the other side of the port. The volunteer force comprised of six adults and two children, who were later joined by beachgoers who happened to be on the said beach – inspired by the civic choir being carried out by the SNL. Besides the previously listed items, the volunteers managed to fill 24 rubbish sacks with the litter found along the beach. 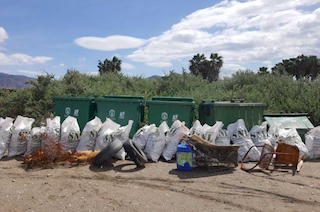 This is not the first time that the Batallón Basurista (Rubbish Battalion) has targeted this area because their volunteers managed to removed a half buried, waterlogged, double mattress from the beach. Right, so who are these people? the Sierra Nevada Limpia group is based in Monachil and through their Rubbish Battalion have carried out operations in several areas of the province. This group of eco-minded friends was founded in 2014 and was the brainchild of two friends who found themselves always picking up litter when out walking in the countryside. The original idea was to concentrate on the Sierra Nevada, as their name implies but as their excursions also took in Güejar Sierra, Dílar, Cumbres Verdes and the coast, they widened operations. Their expenses are covered from their own pockets, so fuel, rubbish bags, gloves and other items are provided by pooling their individual resources. Obviously they are open to any help from like-minded individuals or businesses. Their bank-account details are (IBAN: ES 3730 2301 2163 6228877400) but get in contact with them to learn more, either via email (sierranevadalimpia@gmail.com) or their facebook page. This entry was posted on Tuesday, April 9th, 2019 at 8:30 am	and is filed under Motril. You can follow any responses to this entry through the RSS 2.0 feed.